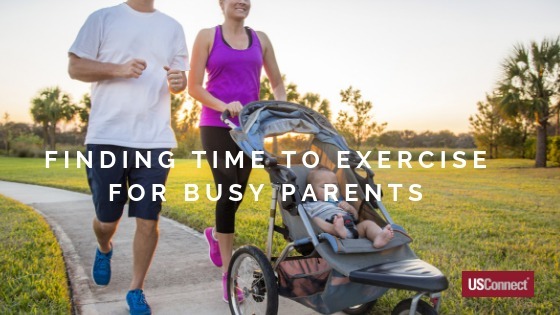 Now that kids are back in school, and you’re back in your daily routine, finding the time to exercise can be a challenge for busy parents. 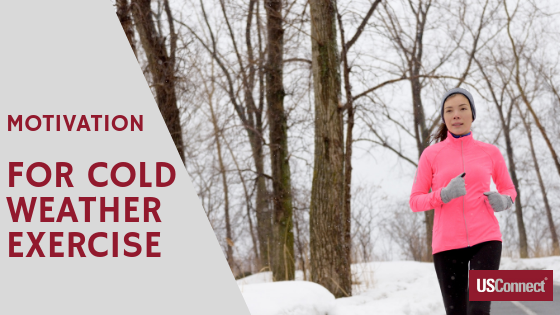 Whether you’re working full-time or part-time along with taking care of a newborn, chasing after a toddler, or chauffeuring older kids to and from school and activities, it’s easy to go for days without fitting in a workout. Add in a hefty dose of guilt for not spending your free time with your kids, and it’s a recipe for abandoning regular exercise altogether. With such busy lives, we have to schedule in time to exercise every week, or it may never happen. Think of it as another way to stay healthy for your family. Even if you get in 10-minute increments throughout the day, just moving more will make a huge difference in your overall health, outlook, and well-being, which in turn, will only make you a better parent. Got a baby or toddler? Take advantage of nap time by loading your little one(s) into a jogging stroller and take a walk, or run for 30 minutes. Enlist a friend to share workouts. You’re less likely to skip a workout if you’ve promised to meet a friend at the gym or at the park for a walk. Or you can also trade babysitting duties while the other works out. Spend time with your kids and exercise at the same time. Kick around a soccer ball with your kids in the yard; go on a bike ride together; walk the dog, or take them to the playground, and join in a game of chase or tag. There are endless workout videos available for download as well as on DVD. Especially when it’s raining or the weather turns cold, working out at home to a video is an easy way to fit in exercise. You can even have your kids join you to make it a fun, family affair. Join a gym that offers childcare or offers a children’s program your kids can participate in while you and your spouse or partner work out. If your office allows, eat lunch at your desk, and use your lunch break to go to the gym, or walk or run outdoors a few days a week. Get up early before the rest of your house, and get your workout out in before your family’s hectic morning routine starts. You’ll start the day energized and won’t have any excuses later in the day when things like a sick child or schedule changes could derail your workout plans. Summer may be winding down, but the weather outside is still hot. 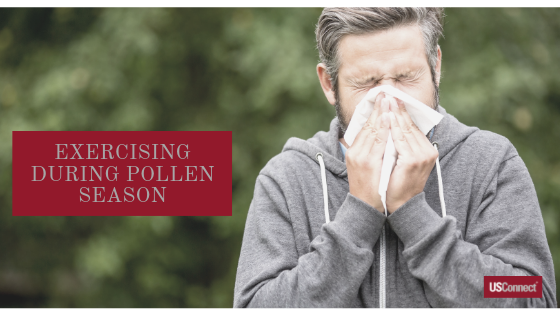 With fall just around the corner, you may be dreaming of pumpkin spice lattes and cozy sweaters, but in many parts of the country, September is still one of the hottest months of the year, so exercising outdoors should still be done with caution to prevent heat exhaustion. 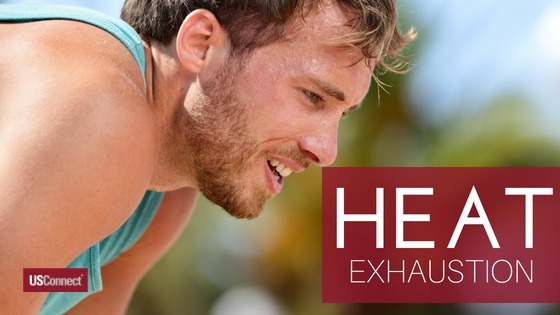 Heat exhaustion happens when your body overheats. This condition is caused by exposure to high temperatures, especially when there is a combination of high humidity and strenuous activity. It is usually accompanied by dehydration. If not treated quickly and properly, heat exhaustion can progress to a more serious, life-threatening condition known as heatstroke. That’s why knowing the signs and symptoms of heat exhaustion and how to treat it is so important. Anyone can experience heat exhaustion, but infants, children, and the elderly are especially at risk during hot weather. Don’t forget that dogs and other pets can also get heat exhaustion and heat stroke, so never leave your furry friends outdoors for extended periods during hot weather, and never leave a pet, child, or infant in a hot car. If you experience any of the symptoms of heat exhaustion when exercising or spending a lot of time outdoors in the heat, the first thing to do is stop the activity and move indoors to a cooler place. Rehydrate your body with water or a sports drink to replace important electrolytes that are lost when your body overheats. Applying ice packs or cold, wet towels to your forehead, back of neck, and wrists can also help. With prompt treatment, your symptoms should resolve in a couple of hours, but if they do not or you feel worse, seek medical treatment as soon as possible. If you do not get out of the heat and properly treat heat exhaustion, symptoms can quickly progress to heatstroke, which is a life-threatening emergency. Signs of heatstroke include confusion, odd behavior, agitation, high fever, and seizure. If you or anyone you are with are displaying signs of heatstroke, always call 911 immediately. 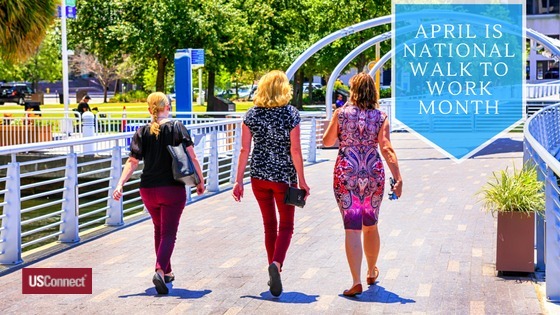 You can prevent heat exhaustion by being aware of symptoms anytime you are outdoors in hot weather and staying hydrated by drinking fluids before, during, and after any activity. If you’re an avid runner, the thought of running on the beach may sound glorious. The sand is soft and inviting, the view is gorgeous … but don’t be fooled, running on sand is far more challenging than you may think. 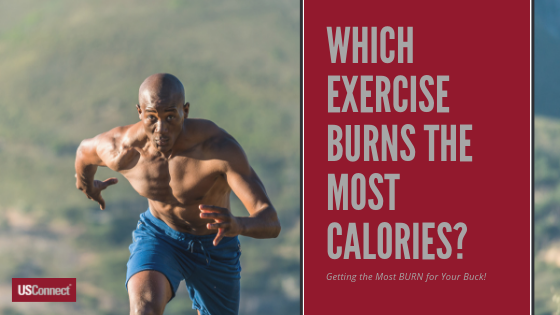 According to active.com, several studies have found that running on sand consumes more energy than running on asphalt—burning as many as 1.6 more calories per mile. There’s also much less impact force when you run on sand, but with the added resistance, your heart rate rises faster, and your muscles have to work harder. If you’re planning to run on the beach while on vacation, or if you’re lucky enough to live close to the beach, take note of these tips before trading in the pavement for sand. Check local tide reports to see when low tide will be before you head out for a run. It’s best to run at low tide or within an hour or two around the lowest point. As the ocean recedes, it leaves hardening sand behind that creates a hard-packed surface perfect for running. For your first few beach runs, wear your regular running shoes. It may be tempting to ditch the sneakers and go barefoot, but running without them on new terrain could end up being too much for your feet and cause pain or injury. Sand can also be hard on your ankles, and sneakers will help provide stability. After you do a few runs on the sand and your body gets more used to it, if you want to go barefoot, your feet should be able to adapt. Just be aware of sharp shells, glass, or other debris on the beach that could cut your feet. 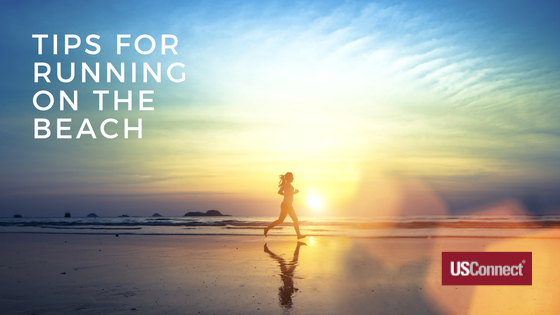 Don’t expect to run your average pace on the beach. The change of terrain and lesser impact of the sand will make it feel like your legs are heavier than normal and will become unbearable if you try to run at the speed you’re used to. Slow down and enjoy the view. Protect your skin while running with an SPF30 water-resistant sunscreen, and be sure to bring a water bottle to stay hydrated. Beach running can be a challenging workout. Be sure to take a rest day in between beach runs to let your body recover from this new work out. It’s July and many people are heading out on that much-anticipated summer vacation: a time to relax and recharge, whether it’s at the beach, lake, mountains, or sightseeing in a new city. While vacation is definitely a time to unwind and indulge, it’s also easy to indulge a little too much and get off-track with exercising regularly. Finding ways to stay active while on vacation is easy to do; it just takes a little forethought and planning. One of the best tips is to remain consistent: If you regularly work out three times per week at home, plan to do the same while on vacation. 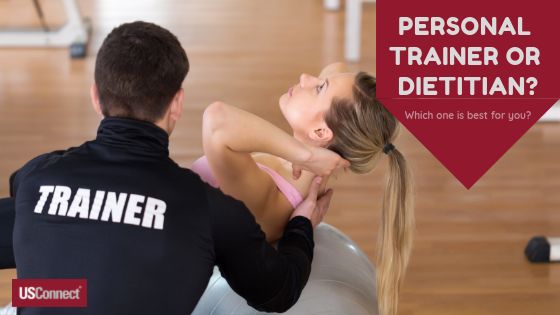 That can be hard for some folks to even think about because most people perceive exercise while vacationing as taking away from the fun parts and also the desire to avoid anything that resembles everyday chores. The good news is that exercise can be a fun part of any vacation and can be easily incorporated without having structured exercise time. – Set realistic expectations – If you don’t work out daily for an hour a day at home, don’t think you can do it while on vacation. Decide how much and what type of exercise you can incorporate into your trip; for example, taking a walk on the beach at sunset counts as exercise. – Pack your workout shoes and clothes. Don’t forget to pack your gear so you’ll be more likely to exercise while away. – Get outdoors. No matter where you’re headed on vacation, getting outside will get you moving. Whether it’s a morning swim in the hotel pool, a walk on the beach, a hike in the mountains, or sightseeing in a new city—all of these activities are easily incorporated into your vacation. – Try new activities. 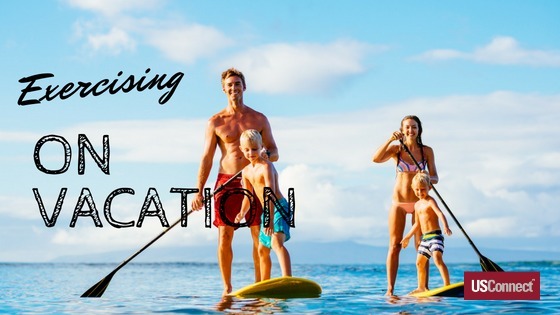 Vacation is the perfect time to try new recreational activities, such as kayaking, paddleboarding, snorkeling, hiking, surfing, and more. You can also join a walking tour to explore local sights and landmarks. – Enlist your travel partners. Vacation is about spending time with family and friends, so grab your travel buddy and go for a run on the beach or rent bikes and hit the trails. You’ve heard the exercise recommendations before—at least 30 minutes of activity most days of the week. But with our increasingly busy lives, sometimes it’s hard to find that small chunk of time to dedicate to working out every day. The most important thing is just to move more. This doesn’t necessarily have to mean 30 minutes of jogging or lifting weights in a gym or an aerobics class. Exercise can be any activity you enjoy that gets you moving, that gets your heart rate up, and makes you feel good. Working fitness into your daily routine is easier than you think. Try not to think of exercise in the traditional sense. 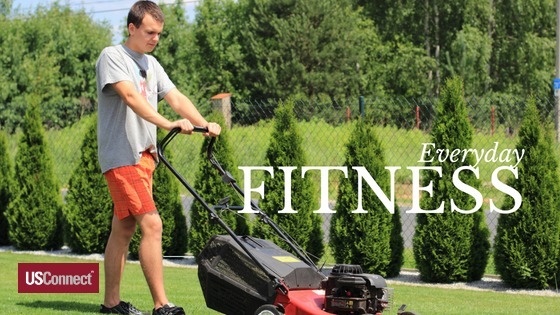 Things like working in the garden, walking your dog, hiking with your kids, or even just mowing the grass are activities that get you moving and count toward your daily activity. The key is to change your mindset about exercise: once you do, you’ll be surprised how you will begin to look for more opportunities to move. Take your dog for a walk, or go to a dog park to play frisbee, or throw a ball. Play with your kids. Get outside and play tag, throw a ball, go on a nature walk, jump rope, run through the sprinkler, and just have fun. Work in the yard. Gardening, mowing the lawn, and raking leaves are hard work! Always take the stairs. And always park your car far away from your destination. Clean your home regularly. Vacuuming, mopping, sweeping, and other chores can be a great workout, especially if you have a larger home. The most important point is to find something active that you enjoy doing—if you’re having fun, you’ll be more likely to stick with it.